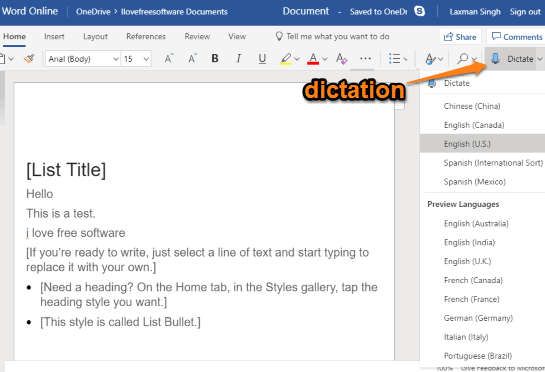 How to Use Dictation in Microsoft Word? This article covers how to use dictation in Microsoft Word. There are many text editors that support this feature. Now MS Word also provides it. The good thing is you don’t have to install some add-in or other tools for that. This is a built-in feature of Word. There are 5 languages to use in the dictation. Other languages are also available but in preview mode. The feature works as speech to text. That means you activate the dictation and speak. It will add the words in the document automatically. Before you try this feature, do note this feature is available in Word Online (for Office 365 users) and it is still rolling out. If you haven’t received this feature yet, you will get it in the future. The screenshot below shows dictation pop-up where different languages are available. Open Word Online and sign in with your Microsoft account. If you don’t have an account, you can create a new one. After that, open a new or existing document. On the top right part, you will see Dictate icon and drop down menu. Click that menu and you will see the pop-up. The pop-up provides 5 languages such as English (Canada), Chinese, English (U.S.), Spanish (Mexico), Spanish (International). Select a language and click on the Dictate option. Other languages like French, English (Australia), German, Italian, etc., are also available in the preview mode. Now you can start speaking and it will add the words in the document. In this way, you can use Dictation in Microsoft Word. If dictation is stopped, you can click dictate icon again and use it. This feature to use dictation in Microsoft Word is really useful and interesting as well. It will also be helpful when you are a bit tired and don’t want to type. You can simply turn on the dictation and start speaking the words to add them in the Word document.